Mention was made here last week to Edward Synge, one-time Bishop of Elphin. His immediate predecessor in that diocese was Robert Howard whose eldest son Ralph in the early 1750s made the customary Grand Tour to Italy. 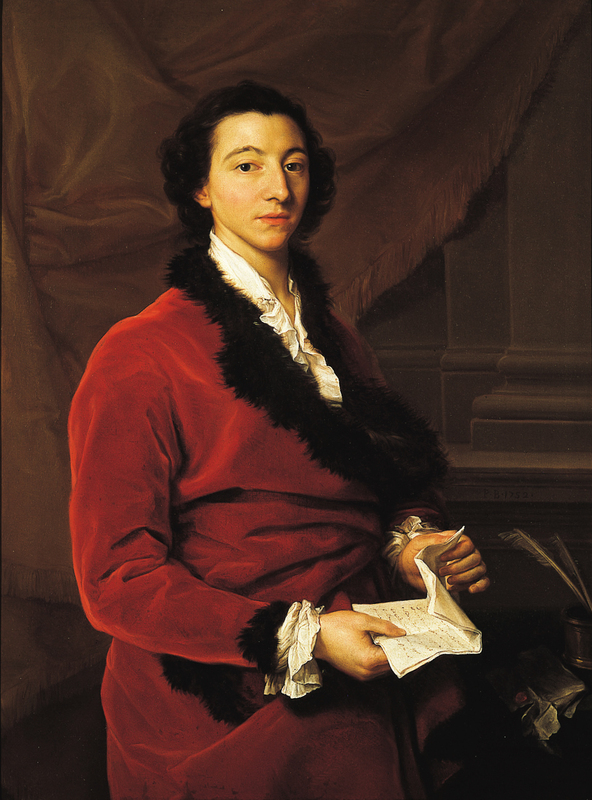 While wintering in Rome in 1750-51 the younger Howard (who in due course became Baron Clonmore and then Viscount Wicklow) had his portrait painted by the city’s most fashionable artist Pompeo Batoni. The picture was brought back to Ireland and hung in the Howard’s seat, Shelton Abbey where its presence is recorded in an inventory of the house’s contents conducted by Bennett’s in July 1914: at that date the work was valued at £210. Sadly Ralph Howard’s descendant, the eighth Earl of Wicklow was unable to maintain Shelton Abbey and accordingly in October 1950 a great sale of the house’s contents was held, an event so substantial that it lasted almost a fortnight. Among the lots was number 1740, the Batoni portrait, although by then its sitter seems to have been forgotten, since he is simply listed as a ‘gentleman in crimson with fur-edged coat.’ In addition, the work’s value had significantly decreased since 1914, as it only fetched £90. Today it hangs in the J.B. Speed Museum in Louisville, Kentucky. Just over sixty years ago in late January 1956, the occupants of Luggala, County Wicklow woke to find the building on fire, apparently started by faulty electrical wiring. Although three local fire brigades were summoned, deep snow hindered the arrival of their engines which in the course of a descent to the house slithered into a ditch and had to be dug out with shovels. Branches were then laid down to form a carpet over which the wheels could travel but once finally at the house, the firemen discovered no water coming from their hoses: they had forgotten to attach the nozzle to the engine. Even once they got underway, the intense cold hampered proceedings, with ladders becoming treacherous to use as ice formed on the steps. By the time the flames were doused at 10am, the greater part of the building had been gutted. Fortunately Luggala’s then owner, Oonagh, Lady Oranmore and Browne immediately embarked on a restoration programme and by March of the following year she was back in the house which today remains in the care of her son, the Hon Garech Browne. A portrait of art dealer and philanthropist Sir Hugh Lane. The picture was painted in September 1904 by Roman-born Antonio Mancini when Lane was visiting the artist’s native city. Tomorrow marks the centenary of the sinking of the RMS Lusitania off the coast of Cork, and Lane was among the 1,198 persons who died on that occasion. I shall be giving two talks in the coming weeks on Sir Hugh Lane. On Thursday 14th May, I will be speaking at the Library in Douglas, Cork at 7pm (for more information, see http://www.vernonmountpark.ie/latest-news) and on Thursday 21st May I will be speaking at Dublin City Gallery The Hugh Lane at 6.45 (for more information, see http://www.hughlane.ie/lectures/lectures-past/1320-evening-lecture-the-commercial-world-of-sir-hugh-lane-art-dealer-with-robert-obyrne). The Mancini portrait continues to hang in the gallery founded by Sir Hugh Lane and can be seen there in an exhibition marking the centenary of his death.